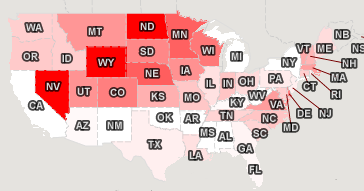 I made a new map of where the stimulus spending was forecast to go. I pulled the data from the White House Web site a few days ago, so note that it is for the proposed stimulus bill, not the bill as it passed. Also, it shows per capita amounts, using 2006 population figures from Wikipedia, so there will be a minor error due to the years being different. I didn’t make a lot of noise about this one because I hope to do another, better one when the numbers are more stable. From time to time since the election, I have burst into tears. Oftentimes it hits me without warning. Today, I burst into tears twice. The first was at seeing a picture of Tommie Smith, John Carlos, and their wives in a group hug with Obama’s inauguration on the TV in the background. Tommie Smith and John Carlos were the two who gave the “black power” salute on the podium at the 1968 Olympic Games. That picture really gave me a sense that we have closed a chapter in our national history. The story of racism in the United States has not ended, but a chapter has closed. Slammed shut. The second time, I could only eke out a “Honey!” Jim asked what, but I couldn’t answer because I was convulsed with sobs. Jim rushed to me, concerned. All I could manage was, “He signed it!” and point at the article saying that Obama had signed an anti-torture executive order. Thank you, Mr. President. I have been waiting for this for a long time. Watching the inauguration today, I couldn’t help but be reminded of gay pride parades. Maybe rock concerts are also places of fun sometimes, but I never had much fun at rock concerts. The band was always too far away to see and yet too loud. The C-SPAN feed of the inauguration didn’t have any commentary, but instead just broadcast the ambient noise of the crowd. For two miles, almost all you could hear was people screaming their heads off as the motorcade (and microphone) moved down the route. Ten years ago, when I marched in the SF Pride Parade with PFLAG, I experienced two miles of people cheering their hearts out. The straight public was not as accepting of gay and lesbian people back then, and thus (I guess) it meant a lot to see straight people standing up for gay rights. So they cheered. In recent years, the cheers for PFLAG have been polite, but not overwhelming like before. That’s a good thing — that means that public acceptance is greater, so PFLAG isn’t as needed. The cheers for PFLAG were a reflection of how bad things were elsewhere, and how PFLAG represented a beacon of hope. It is a very good sign that the cheers for PFLAG are tamer now. Similarly, the cheers for Obama reflected how bad things were. It would not have been so moving for African-Americans if African-Americans had not faced such brutal ill-treatment in the US. It would not have been so moving for me, a white person, if I had thought that G. W. Bush had done a competent job. I hope that at the inauguration of the next non-white president, the crowds are much smaller and tamer. Do not take my silence on Caroline Kennedy as an endorsement. I’ve just been busy. I am almost as offended that Caroline Kennedy is being considered for New York senator as I was when McCain picked Palin. I say “almost” because Senators do not have authority to fire nuclear missles. Selecting Caroline Kennedy is merely a bad idea, not scary. I am dismayed with my own party that they are not raising a bigger stink about her. Somehow the magic of the Kennedy name seems to be enough to quiet lots of people. Huh? Now, I am willing to believe that being part of a political family can be useful. You do learn things at the dinner table. (My father was a professor of Physics; I was in college before I realized that not everybody drew free-body diagrams on napkins over dinner.) So Caroline Kennedy might have learned something from her father. Except that she stopped having dinner with her father when she was six. Maybe her mother helped instill political savvy into Caroline. I wasn’t there, I don’t know, but I never heard much about Jackie Kennedy Onassis being much into politics. Kennedy, sorry. I don’t see how she qualifies. One of the things I really like about Obama is what, for lack of a better term, I will call middle-class values. He does things like clean up after himself at an ice cream shop, carry his own luggage (pictures here and here and here) and says he turns off lights and will make his kids do chores in the White House. I don’t recall ever seeing any of the presidents in my adult lifetime — Reagan, Bush 41, Clinton, or Bush 43 — ever carrying anything, even when they were campaigning. I suspect that Bush 41 never washed a dish or picked up dog poop — ever. I can’t imagine that either of the Clintons would do so now. People in power frequently have other people do mundane things for them. There is a potential that, by doing things himself, Obama could make himself seem less powerful. Jimmy Carter once spent the night in a private home, and it was reported in all the newspapers that he made the bed himself. My recollection of that is that people were kind of incredulous at him diminishing himself that way. However, Jimmy Carter ran with a persona of folksiness. (He was Jimmy Carter, not James Earl Carter, Jr.) He had to struggle a little against being perceived as a rube, a southern bumpkin. 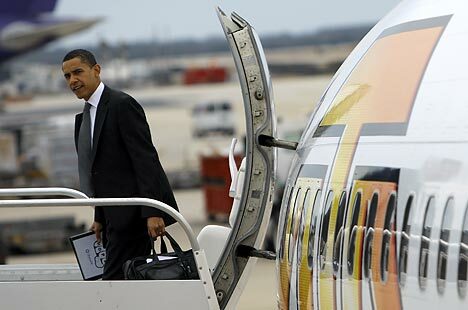 I don’t think Obama really risks debasing himself in the public eye by doing mundane things for himself. In contrast to Jimmy Carter, Obama has a public persona that is a bit cold and standoffish. He even got attacked for being elitist for a little while. Doing mundane things for himself counters that perception. Maybe he carefully does these mundane things for show. Maybe he’s conscious of it and wants to “keep it real”. But maybe it’s part of his value system that he is not inherently better than other people, and should play by the same rules as the rest of the world. (Unlike, say, Arnold Schwarzenegger, who has demonstrated a pattern throughout his life of acting like rules were for other people.) I hope so.